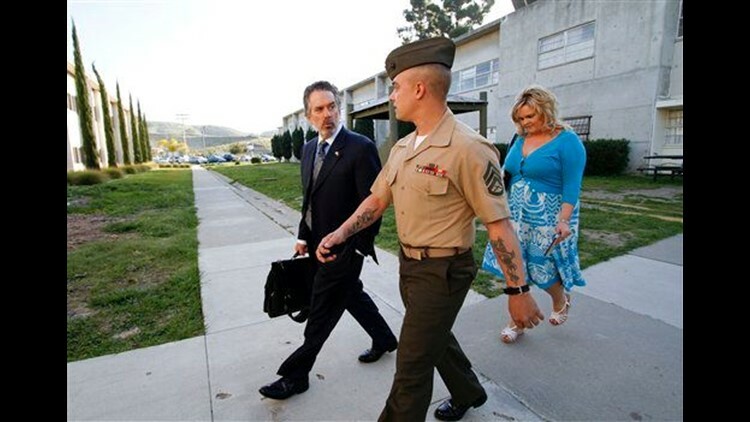 CAMP PENDLETON, Calif. (AP) – A military judge on Friday refused to dismiss charges against a Marine who led a squad that killed 24 Iraqi men, women and children in the town of Haditha after a bomb killed a Marine. The ruling cleared the way for a court-martial for Staff Sgt. Frank Wuterich, the only remaining defendant in the biggest criminal case against U.S. troops to arise from the Iraq war. Wuterich, seated in uniform, showed no emotion when the judge said, "motion is denied." Marine Lt. Col. David Jones said attorneys for Wuterich failed to a show that two generals who oversaw the case were influenced by a top aide who was disqualified under military policy from giving advice because he had investigated the killings on a previous assignment. James said it was probably not a good idea for the aide, Col. John Ewers, to have been in the room when the Haditha case was being discussed. but there was no suggestion that his presence influenced the generals or stifled junior attorneys who were present. "The court must deal with the facts, not mere speculation or conjecture," Jones said. The judge said he was convinced the general who brought charges in December 2006 and his successor who ordered a court-martial a year later had done extensive independent research. "It is reassuring to know that the generals really did their homework ... and didn't merely act as a rubber stamp," Jones said. The 30-year-old Wuterich, of Meriden, Conn., is one of eight Marines originally charged with murder or failure to investigate the killings that occurred after the roadside bombing. Six have had charges dropped or dismissed, and one was acquitted. A trial is scheduled for Sept. 13 for Wuterich on reduced charges of voluntary manslaughter and other crimes in the November 2005 shootings. The end of the case would likely have met outcry in Iraq, where many see a lack of accountability for the actions of U.S. troops through the seven years of war. Iman Walid Abdul-Hamid, 14, from Haditha was wounded and lost her parents and a brother in the attack. U.S. troops took Iman, who was 9 at the time, and her 6-year-old brother to Baghdad for treatment. "We were sleeping. My father was reciting Quran in another room, when the soldiers broke the door and shot him dead," she said. "These killers should be killed. Their case should not be closed before they are justly tried. It is not right to throw away this case." Wuterich is currently assigned to administrative work at 1st Marine Division headquarters at Camp Pendleton. The deaths occurred after a Marine was killed by the roadside bomb. The judge previously said Wuterich's attorneys presented credible evidence regarding the role Ewers but said Friday the government had addressed those concerns. The defense had argued that Ewers' mere presence stifled junior attorneys who were assigned to advise the general. Court papers describe how Ewers, who was seriously wounded in Iraq in 2003, had a stellar reputation and a long history with Gen. Mattis. Associated Press Writer Bushra Juhi in Baghdad contributed to this report.